Pirate is a little crazy about cu-cuttahs! loves them! any time we see one on the road he must scream "cu-cuttah, cu-cuttah!" over and over until we acknowledge his sighting. and being that it IS motorcycle season - we see lots and lots of cu-cuttahs. hubby had a wonderful cruiser cu-cuttah that we all loved. Pirate could sit right in front of dad and put his little feet up on the tank. 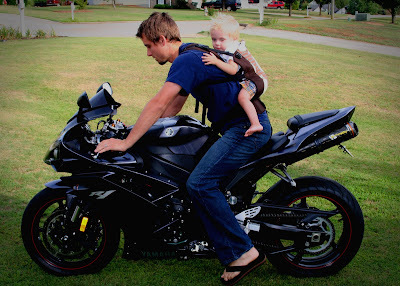 dad took him on many rides around the neighborhood like this. and though Pirate never looked too excited while actually riding, we knew it was his favorite thing by the fits he pitched when we tried to take him off the cu-cuttah. so he traded his cruiser cu-cuttah in for crotchrocket cu-cuttah. the only problem: where would Pirate ride now?! he couldn't prop up on the tank b/c dad had to practically lay on the tank to drive. 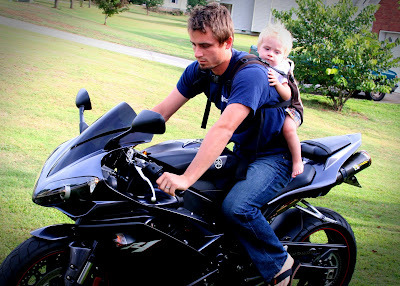 he couldn't ride on the back b/c he's too little to hold himself on. it seemed we had a very serious problem on our hands. but, no worries. mom came to the rescue with her beco butterfly carrier and we were off! it's not the most manly carrier around - but pear print isn't as bad as it could be! 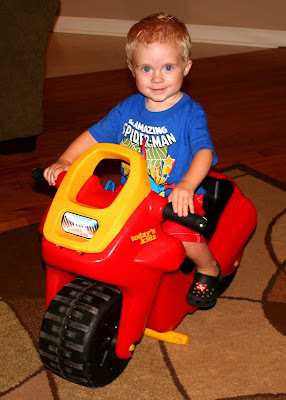 so now Pirate has a new cu-cuttah to ride around in a new way... and he's just as content now as he was before. AND our neighbors gave us a cu-cuttah that their son had grown out of and wouldn't you know that just thrilled little Pirate. he loves his "bebe cu-cuttah". he plays on it every day and cries for it when we're not home. obsessed? i think so. no worries. mom is NOT budging - Pirate will not get a cu-cuttah when he turns 16... or 18... or 21... if i can help it! Girl you're so brave to let your hubby still drive! I'm struggling with that right now... Sam LOVES to ride... (sigh)... he is such a fearless dare devil and I have a feeling Aaron is going to be just like him :) Gotta let go... What is a mom to do? This is hilarious! 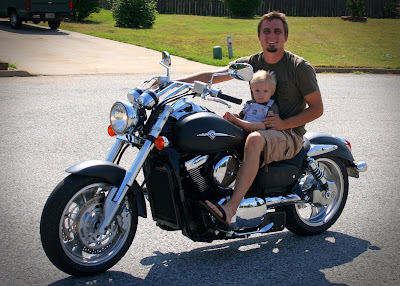 Zach also has a crotchrocket cu-cuttah and Mac is obsessed as well .. funny ... Zach has never taken him riding but I am sure if he saw this post he would ... shhh don't let Tyler say ANYTHING!